The Pickens County Sheriff’s Office is currently conducting a joint investigation with the Liberty Fire Department into the circumstances of a structural fire that occurred Thursday morning at 401 Morning Dew Court. A fire was reported at approximately 11:20am with information that a residence was on fire and that an occupant may be trapped inside the residence. Fire and EMS personnel arrived on the scene and discovered heavy smoke inside the single story modular home. An adult female advised first responders that she lived at the location and was asleep when she was woken up by the sound of her dog barking. The interior of the residence was filled with dark smoke and she escaped through a bedroom window. Firefighters located an adult male inside the residence that had not been able to escape. He was pronounced dead at the scene. 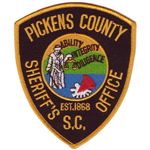 The Pickens County Sheriff’s Office has requested specialized services from the South Carolina Law Enforcement Division to assist in the investigation of the cause and origin of the fire.